Whether you spend $2 or $20+ on a bottle of nail polish, it pays to shell out a little extra for a good top coat. I learned this the hard way after many a ruined home manicure with an inferior top coat, where I would wait 2-3 hours between doing my nails and going to bed, and still wake up with dents and crease marks. 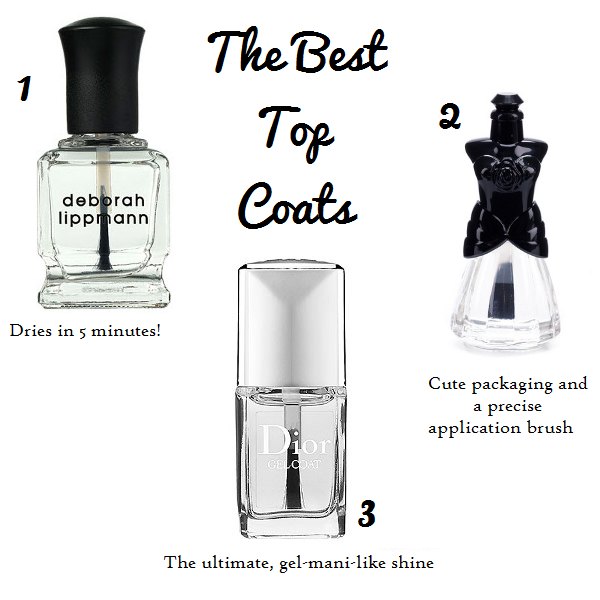 But those days are behind me thanks to these 3 tried-and-true top coats. 1. Deborah Lippmann 'Addicted to Speed' top coat ($28 at BeautyMark) was the first top coat I tried that opened my eyes to what a top coat could be. The aptly named formula sets in 5 minutes and dries to a hard, glossy finish in 15, with no risk of creasing or denting. The only downside with 'Addicted to Speed' is that, over time, the formula thickens in the bottle and becomes more difficult to apply. 2. Anna Sui Gel Top Coat ($15 at The Bay or Shoppers Drug Mart) gets extra points for its adorable bodice bottle, easy-to-use brush, and nourishing olive and grape seed oils. The shiny finish tends to go cloudy within 1-2 days, but the formula does dry within 10 minutes and extend the life of manis. 3. Dior Gel Top Coat ($25 at Dior counters) was introduced as a limited edition for spring/summer 2013, but has become a permanent offering by popular demand. This is hands-down my favourite of the bunch. Not only does it set to a wet-looking, crease-free shine in 10 minutes and keep my nails chip-free for 4+ days, it makes even a $4 nail lacquer look like a million. I'm definitely purchasing this one when my review sample runs out!